Once known widely as Business Process Outsourcing (BPO), today, Business Process Management (BPM) has been referred to as a “holistic management” approach to aligning an organization’s business processes with the wants and needs of clients. KPM uses a systematic approach in an attempt to continuously improve business effectiveness and efficiency while striving for innovation, flexibility, and integration with technology. The SLASSCOM Executive Briefing on ‘Future Outlook for Business Process Management” will examine the future outlook for the RPM industry. Eric Sclvadurai serves as Managing Director of the European Business of WNS. He is based in London and brings over 29 years of experience in the business process outsourcing industry, having built multi-location operations for large organizations. Prior Lu assuming the role of Managing Director Europe, Mr. Selvadurai was the Chief Executive Officer of WNS Enterprise Services business and President, Global Operations. where he was responsible for setting up and rapidly growing WNS delivery centers in India and Sri Lanka to meet growing client demand. 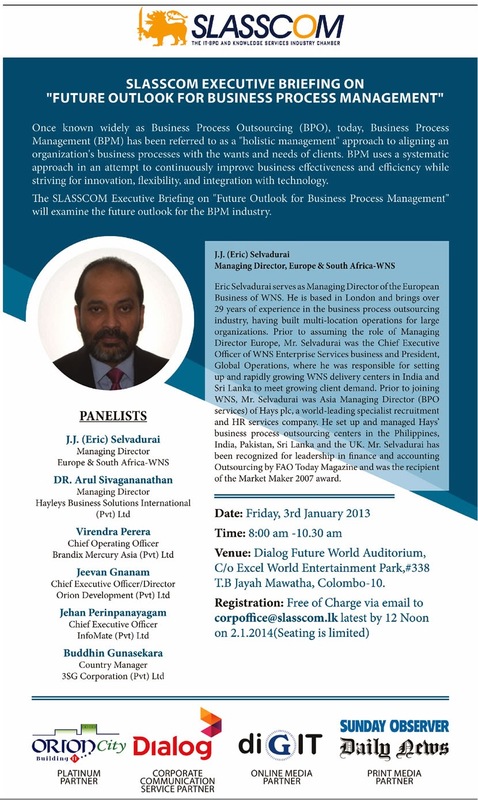 Prior to joining WNS, Mr. Selvadurai was Asia Managing Director (iWO services) of Hays plc, a world-leading specialist recruitment and HR services company. lie set up and managed Flays’ business process outsourcing centers in the Philippines, India, Pakistan, Sri Lanka and the UK. Mr. Selvadurai has been recognized for leadership in finance and accounting Outsourcing by FAO Today Magazine and was the recipient of the Market Maker 2007 award. Venue: Dialog Future World Auditorium, C/o Excel World Entertainment Park,#338 T.B Jayah Mawatha, Colombo- 10. Click Bellow Image for more information's.